Lleyn rams are an ideal way to inject maternal traits, fertility, and hybrid vigour back into breeding ewes. They are also becoming popular for crossing onto hill and lowland ewes to produce a quality prime lamb or to produce a Lleyn cross female replacement that carries the qualities of the Lleyn ewe. 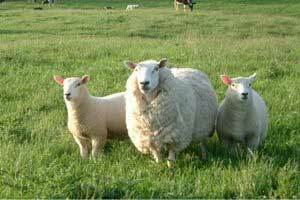 Lleyn are medium sized, lowland sheep. Ewes average 165 lbs and have good mothering instinct and milk production. Renowned for their hardiness and prolificacy, they frequently twin and need very little shepherding. Rams are frequently used to to inject vigor into lowland sheep flocks and to improve meat quality. The breed standard is fairly succinct: Fleece should contain no kemp, have dense locks and be of a warm white color. It should be crimpy and, water repellant. The British Wool board grades it as a medium wool. Experience reflects that Lleyn is a bit of a longwool crossed with a very dense down type – reminding me of Montadale and Hampshire. Wool should not extend below the hock and should begin at the base of the ear, with faces clean of wool – they look a bit like a fluffball on legs.